Find the strength your papers need to carry on. These super-thin, reinforcement label rings are designed to strengthen and repair punched holes in binder paper. Self-adhesive clear rings reinforce without covering up information and are permanent. The clear labels virtually disappear onto your pages for a sharp, clean look that won't conceal important information. Find the strength your papers need to carry on. These super-thin, reinforcement label rings are designed to strengthen and repair punched holes in binder paper. Self-adhesive clear rings reinforce without covering up information and are permanent. The clear labels virtually disappear onto your pages for a sharp, clean look that won't conceal important information. The labels come packaged in a handy dispenser that peels each self-adhesive reinforcement off the roll one by one. 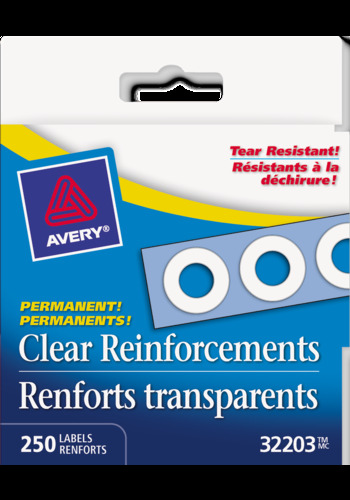 Apply the reinforcements to your standard-size punched holes to provide a durable border that resists tearing.Reinforcement labels offer 1/4" diameter holes. Your punched holes will be stronger for the experience.